I didn't mean to make this a series, but I pointed this out to someone last week, and they had NO idea this was true. So here's 1MM #2, why you get those red underlines on your text? It's not just randomness, but actually something really useful! If you CONTROL- on those redlines, your computer will pop-up a set of options... including some possible re-spellings. Handy, eh? Fast Answer: This one is too close to call! This challenge is quite typical of real-world search tasks--you often can’t just plug in the search terms and hope to get an answer. A little search chaining and data validation is required to answer a series of questions and link them together to find the answer. Let's start at the top. I assume you know that “the Plex” refers to “the Googleplex,” the name of the main complex on Google’s campus in Mountain View. And from a quick scan of the SERP, you'll learn that "the Plex" is shorthand for "the Googleplex" (which is where I took the picture above). ...and you can easily find that the Plex is at 37.422°N 122.084°W – plug that into Maps.Google.com and you’ll see our campus with that lat-long marker just outside the window from my office. 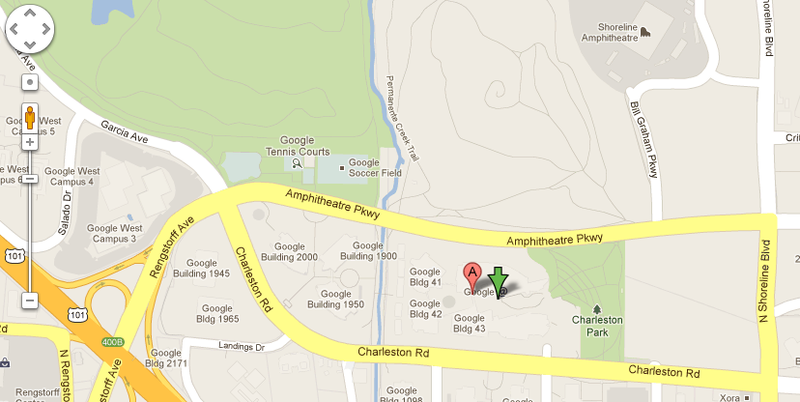 As you can see by the location of the Googleplex, you’ll see it’s pretty close to the waters of San Francisco bay. So this possibility of flooding after a 10' rise is a real worry! Now you know WHERE to look. Next step—determine the elevation of our location in the Plex. As you can see, the point of the pin is right between the red "9" (meeting 9 feet elevation) and the 10-foot contour line that I've marked. 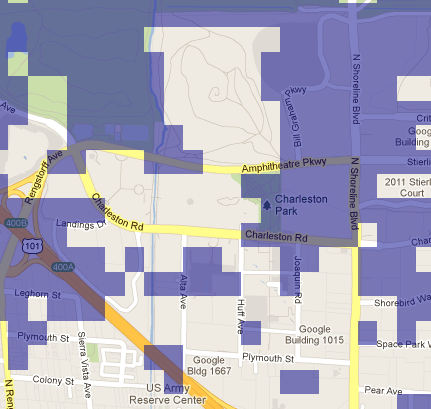 Of course, the data accuracy here LOOKS better than it really is. While USGS is famous for measuring elevation accurately, the smoothness of the contour line implies a level of precision that's not really there. It's probably quite close to correct, but let's keep looking for additional data sources. 2. Find a tool to get the elevation. A great general heuristic for these kinds of search questions (that is, when you're looking up data that someone else has a great deal of interest in) be sure to look for a tool (that is, a web-application) that already does what you're trying to do. Plug in the lat-long and find this spot is recorded as 12 feet above the mean sea level. 3. Use Google Earth. I then remembered that Google Earth ALSO has a 3D model of the earth, and what's more, it shows you the elevation of the point you've selected at the bottom of the page! 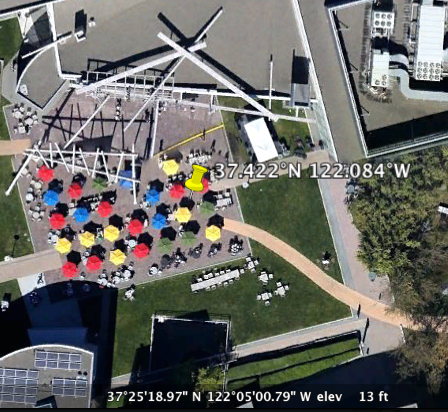 Here you can see the exact location of our lat/long point (in the middle of the umbrellas and tables set out for lunchtime. (The white lines are big, decorative beams, one of which is shown in the picture at the top of this post.) And, as you can see, Earth puts the elevation at 13 feet. That's encouraging, but don't stop searching just because you found an answer you like! On the other hand, a similar tool at Geology.com shows that we'd be on a peninsula with a rise of 3 meters (9.8 feet). 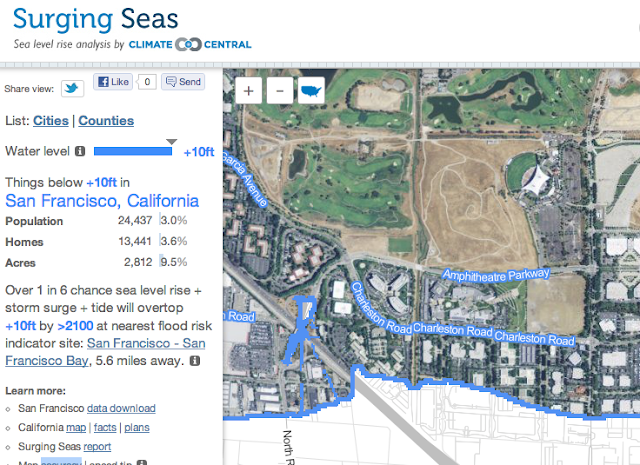 http://geology.com/sea-level-rise/san-francisco.shtml -- which (at 3m rise) shows that we’d be on a peninsula, just barely out of the water. This analysis suggests that ALL of these maps have a margin of error that's pretty big--certainly within the range of watery-ness for the Googleplex. And when you consider that "elevation" is defined as "height above the average high-tide and low-tide points in that region." it's pretty clear that this case is too close to call. We have some measurements that put the Plex out of the water by 1 or 2 feet, while others say it's 1 or 2 feet underwater. Since the tide will go in and out in this part of the Bay by +/- 3 feet, I'd say we'd better start developing that beachfront! Search Lessons: There are multiple points to make here. 1. Data varies a lot. As you can see from the four different sources we found 4 different elevations. Sometimes this comes from genuinely different measurements, and sometimes it comes from handling the data in slightly different ways. I doubt that the lat/long for the Googleplex cafeteria was actually measured carefully (at least in publicly available way--I'm sure some surveyors have done this), and so all measurements we see here are approximations. 3. Chaining search steps together. If you already knew what "the Plex" was, that's one step you didn't have to do. But if you didn't know that, you' d have to go look up what I meant by that phrase first, then look up the elevation. This is a simple chain of length 2, but more complex tasks might require chains of 3, 4, or even 9 steps to get to where you want to go. 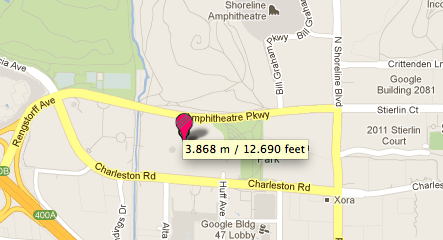 So in the final analysis, the elevation of the Plex is somewhere between 9 and 13 feet. But given the tides, it's probably right on the edge of a 10 foot sea level rise. We don't need to pack our bags yet, but it's worth paying attention to the level of the water! Wednesday Search Challenge (11/28/12): Will the Plex be underwater? In the aftermath of Superstorm Sandy, everyone who lives near the coast keeps thinking about water levels—when something like Sandy comes racing up your shoreline, will you be swamped? 2. let us know HOW LONG it took you to find an answer you believe. Introducing the "1 Minute Morceau" -- #1 -- "Spelling Goodness"
As I mentioned last week, I thought I'd explore the idea of creating a few 1 minute long "morceau" that teach you something about search. Here's the first one in what I hope will be a long series. I'm interested in your comments, positive or negative, about this idea. I put this on YouTube with the Creative Commons attribution license. That means you're free to use it anywhere (just give an attributed-to shout-out when you use it). Remember, the question was: Can you find another country that has celebrated a annual Thanksgiving festival in November more-or-less continually for at least the past 1000 years? I got to thinking about this because I know that other countries around the world have their own November harvest festivals, and I actually wondered which had been going on the longest. So I started by asking the query about Thanksgiving festivals in general, fully expecting to start broadly and then filter out the ones that weren’t in November. For instance, there’s Chu Suk (or Chuseok) in Korea (usually in September); Kadazan (or Tadau ka'amatan) in Malaysia (May); Pongal in India (January) and many more—but relatively few of them are in November! So solving this search challenge is really about first collecting all of the possible celebrations, then testing each to see which satisfy our conditions. I started my search by opening up each of the festivals in the Wikipedia list and checking dates. Only a few qualify. And of those, only a few have been going on for so long. (1) St. Martin's Day (also known as the Feast of St. Martin, Martinstag or Martinmas) qualifies—it’s been going since the 4th century in central Europe and has lots of associated rituals and ritual foods eaten at the time. Goose is most common dish, but half-pretzels, wine and other pastries are all associated with the story. Since this is all in Japanese, I had to do a bit of work to get reasonably accurate background information. So when I did my searches, I checked both “Niiname sai” and “Niinamesai” AND I checked with the Japanese name as well. Since one book was useful, I kept looking at other books, using Google Books to find that “Matsuri: The Festivals of Japan” (Herbert Plustschow) HAS the word “Niiame” in it, but--alas--I needed to go to Amazon.com (and login) to read the text. There I learned that in the festival celebration, the Emperor makes an “offering of first fruit to sun deity Amaterasu” (meaning, the first rice harvested from seedlings he planted himself). Whether or not he was legendary, the practice of Niinames Sai was certainly formalized by 484 AD, as mentioned in the Nihonshoki book (classical Japanese history text) of the 22cnd emperor, Seinei (480-484 AD). and found the book, Monarchies: What Are Kings and Queens For? in Google Books, by Tom Bentley, James Wilsdon, James Wilsdon, which explained that Jinmu, although apparently a fiction, there WAS someone around that time that did some remarkable things... including establishing a harvest festival called niiname sai! This leaves the start of the Thanksgiving holiday in Japan somewhat open, but I'm willing to bet it's at least two millenia. Answers: There are at least 2 answers to this search challenge: First is Martinmas, celebrated in Central Europe with roast goose, to commemorate the sacrifices of Saint Martin, who was supposedly given away by a honking goose, which is why they’re eaten. And second, Niiname Sai, celebrated in Japan since 585 BC with the first rice harvested that year. Search lessons: Sometimes you have to look through a long list of options, excluding possibilities. I tend to open up all of my options in separate tabs (by control-clicking on the link) and then evaluating whether or not they satisfy my criteria. I also used Books quite a bit to answer my questions. Why Books? Mostly because there are a LOT of low-quality sites around the topic of festivals, and I was really looking for something that has persisted for millennia. That is, I know from general knowledge of sociology, the topic of books. I’d guessed (rightly) that many people would have written about the history and practice of these traditional festivals. And I just didn’t want to deal with all of the advertising literature about why visiting this exotic location would give you the TRUE experience of Thanksgiving. One of the things I’m thankful for this year is all of the scholarship that countless writers have put out there into our collectively accessible store. For all that time and effort they spent, I can know more about the world. Thanks, authors and writers everywhere! Wednesday Search Challenge (11/21/12): A thousand years of Thanksgiving? But other countries have much longer-standing festivals of harvest celebrations. Can you find another country that has celebrated a annual Thanksgiving festival in November more-or-less continually for at least the past 1000 years? If so, what's the name of that festival? When you send in your answer, let us know about how long it took you to find the answer and what your research process was. My answer will be posted tomorrow! Search on... for a thousand years!